A "Socialisme ou Barbarie" Anthology: Autonomy, Critique and Revolution in the Age of Bureaucratic Capitalism. Translated from the French and edited anonymously as a public service, June 2017. Window on the Chaos, Including "How I Didn't Become a Musician" (Beta Version). Translated from the French and edited anonymously as a public service, July 2015. Democracy and Relativism: Discussion with the "MAUSS" Group. Translated from the French and edited anonymously as a public service, January 2013. Postscript on Insignificancy. Translated from the French and edited anonymously as a public service, March 2011; expanded August 2017. A Society Adrift. Translated from the French and edited anonymously as a public service, October 2010. Figures of the Thinkable (including "Passion and Knowledge"). Translated from the French and edited anonymously as a public service, February 2005. The Rising Tide of Insignificancy. Translated from the French and edited anonymously as a public service, December 2003. A message from NOT BORED! 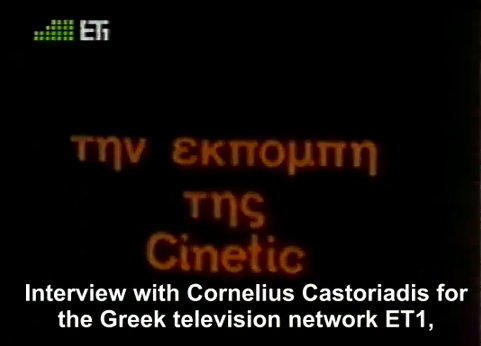 With the exception of the interview with Cornelius Castoriadis for the Greek television network ET1, which was sent to us by the very people who translated the spoken Greek into English subtitles, all of the materials presented here were sent to us electronically by a "Paul Cardan," whose identity is unknown to us. We have decided to post these texts to this website in the spirit in which they were originally translated and edited, that is to say, in the spirit of the free exchange of relevant and useful information. We have not received, and will not receive any financial compensation whatsoever for our involvement in this important project. To read an article about this on-going project that was published in the 26 March 2004 issue of The Chronicle of Higher Education, click here.